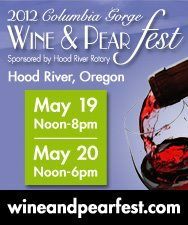 Raise your glass and join the festivities in the Hood River Valley. This annual event held in the heart of Wine and Pear Country celebrates the Columbia River Gorge and its local chefs, fruit, wine and art. Create memories and plan to stay the weekend at an inn of the Columbia River Gorge Bed and Breakfast Association some just minutes from the WAAAM Museum where this event is being held.